The PowerScan PM9500 from Datalogic is a robust area imager offering excellent mobility for industrial operation. The wireless scanner impresses with Datalogic’s STAR 2.0 narrow band radio version with 433 MHz. Compared to its predecessor, the STAR 2.0 is up to 25 times faster and offers a larger range up to 150 m (with an unobstructed view). 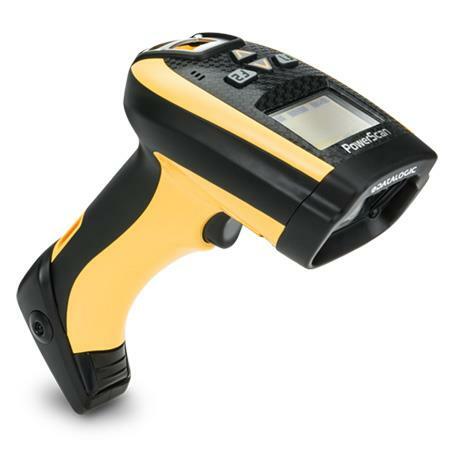 In addition to the standard version there is also a powerful high performance variant, equipped with an innovative liquid lens for scanning distances ranging between direct contact to over 1 m. To round out the offer, there are also versions available with a display and four programmable keys, plus a DPM variant. The decoding engine of the PM9500 delivers the strong reading performance you are accustomed to, and also reliably captures images. Its housing is robust enough to withstand repeated drops from 2 m. It is IP65-certified against water and dust, and works flawlessly in extreme temperatures (-20 to +50°C), making it ideal for both indoor and outdoor operation. And, because the PM9500 is entirely backwards compatible it also is a budget saver.